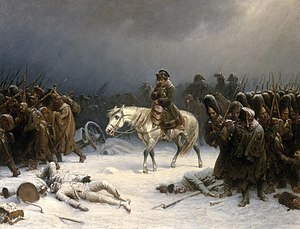 During Napoleon Bonaparte's retreat frae Roushie in the winter o 1812, mony truips died frae hypothermia. Hypothermia is defined as a body core temperatur ablo 35.0 °C (95.0 °F). This page wis last eeditit on 12 Februar 2018, at 04:52.